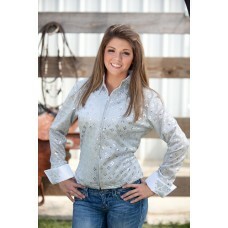 White Glitter features a bold white color glitter fabric with sequins in a diamond pattern for extra sparkle. The white satin french cuffs and collar are beautifully embellished with rhinestones. The blouse has a full front zip and a edge to look lovely untucked, or wear it tucked in. Hand wash only.